A stand-alone novel in the best-selling Man-Kzin War anthology series created by multiple New York Times best seller Larry Niven. 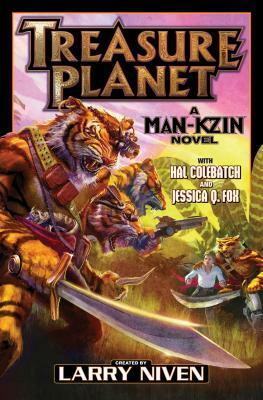 A young man and his Kzin friend seek technological bounty on a forbidden planet while in a race with Kzin space pirates willing to kidnap and kill to make the treasure their own. "Ah, the wealth o' the treasure planet be beyond the dreams of Man or the hopes o' Kzin "
Hal Colebatch is an Australian writer, journalist, editor and lawyer with a wide range of publications. He's best known in science fiction as a long-time series author in the Man-Kzin War universe, with many appearances in the popular anthologies helmed by Larry Niven. He has created several original characters including Dimity Carmody, Nils Rykerman and Vaemar-Riit. Jessica Q. Fox is an engineer with a major in stochastic control. She has had four other books published. What the Q stands for is a closely guarded secret.